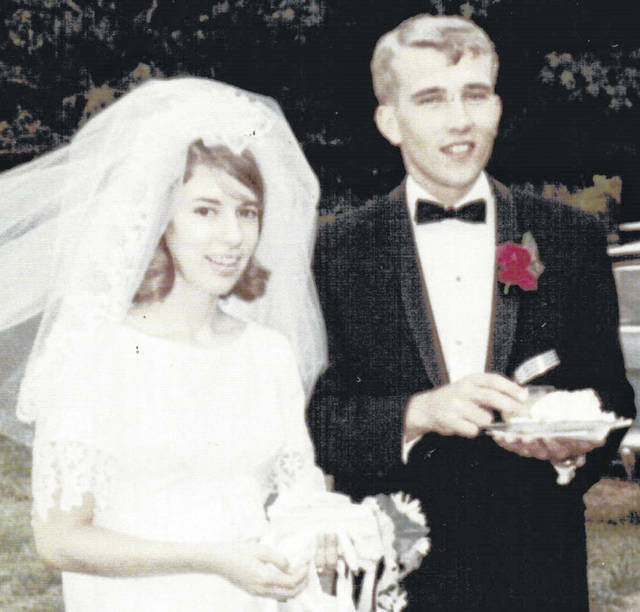 Dr. Grant and Gladene (Carman) Johnson of North Lewisburg celebrated their 50th wedding anniversary with their children, Laura, Otho Galen, Chet and Jed, and their spouses and children. They were married Aug. 25, 1968, in a garden wedding on the family farm in Mingo. They are the 5th generation of Johnsons and third generation of Carmans to be married 50 years. Dr. Johnson served in the Army, worked for Ohio State University and now is a partner with son Otho Galen in the Johnson Veterinary Clinic. He has been practicing veterinary medicine for 50 years. Mrs. Johnson is retired from Security National Bank and the Champaign County Library and now volunteers at the Champaign Family YMCA. This was a double celebration. Dr. Johnson’s brother Alfred and his wife Marion (Crist) also celebrated their 50th anniversary. They were married Aug. 10, 1968.